On a cold, dark and wet Valentine’s Day evening I find myself in Ynysangharad Park, Pontypridd looking for ‘The Winter Garden’, a new installation by Jackie Chettur. 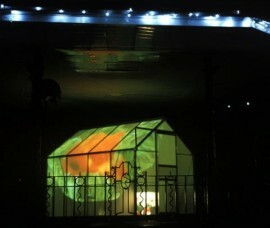 Drawn by the only glow of light in the park to the bandstand, there, unbelievably, under the protection of the bandstand’s canopy, is a brilliant technicolour greenhouse. It is the sort of aluminum greenhouse you might find in a back garden or on an allotment, but definitely not on a bandstand. This visual dislocation and the strength of light and colour compels us onto the stage, to become part of the spectacle. 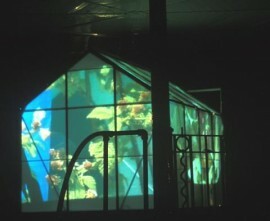 Ever-changing, still and moving images of horticultural endeavor and achievement are projected from within on to the frosted glass walls and roof. These images – of blooms protected by hundreds of plastic coffee cups (to stop colour bleaching), strawberries ripening under cloches or cut stems laid beside trophies – fit the architecture of the greenhouse immaculately, changing precisely at a corner, or fitting between two glazing bars. Circling the greenhouse and finding the door closed, it becomes apparent that we are not going inside. Simultaneously, we become aware of voices emanating from inside. These voices are drawn from conversations with local gardeners. Personal stories, anecdotes and insights communicate the skill and passion involved in achieving the ‘perfect specimen’. The quiet voices, the opacity of the glass and the physical inaccessibility to the internal space provoke a sense of eavesdropping on private thoughts behind a public display. It is this mix of the public (facade) and private (obsession) which makes ‘The Winter Garden’ so vivid and curious. Jackie Chettur has created an unusual hybrid of desire and community, ritual and heritage, passion and formality, which leaves us situated in a strange place, somewhere ‘in-between’. At the ‘Rhondda Rose Society Show’, competitors hope that their blooms will be judged more perfect than the rest. A sense of the familiar-in-excess is at the heart of ‘The Winter Garden’, where the municipal park becomes a community paradise akin to a drive-in movie. The mis-connection between the ‘real’ and wished-for is most visible as summertime replayed within winter. The experience of seeing a bee drift by, gently blown by a summer breeze is immediately checked by the reality of the bitter chill of Winter on your cheek. A moment later, reality is interrupted again by the incongruity of birdsong in darkness. These hiccups remind us of the temporary nature of the luxurious growth that is now only visible as a technicolour trace. Despite the elaborate processes revealed – from documentary behind-the-scenes shots to finished still life tableaux of winning displays – we are made aware that however well rehearsed or planned for, the vagaries of nature are always there to hold us in check. I noticed a teenage couple leaning against the bandstand, looking on silently – perhaps a Valentine’s date? As a grower reminds us from inside ‘The Winter Garden’, “you need to be an optimist”.